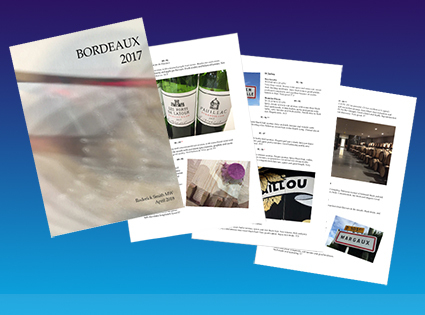 The Bordeaux Report 2017 is now ready! After a trio of good to great vintages in 2014, 15 and 16 (of which the 2016s are undeniably superb), the devastating frosts and uneven ripening conditions of last year gave scant hope for a continuation of greatness. And in some ways 2017 is more 'up and down'. But the top wines are the equal of those from the previous years, and may well prove - if not a bargain exactly - then a shrewd investment from the drinkers' perspective. I spent a week tasting as many wines as I could - 191 reds, around 21 dry whites and 15 Sauternes. You can download my full written and annotated report with photographs by clicking here. It is 4MB. I have also presented the wines as an Excel file which shows them in order of score (as well as alphabetically on the second sheet), and can be sorted however you wish. This is available by clicking here. Please feel free to leave comments or e-mail me with any questions!